Written in 2000 when the Mets and Yankies were trying to dominate the majors. The Cygnoids were going to have six legs, but it was decided that such an alien would be unsuited to blernsball, and hard to animate. At one point they were praying mantises. Attempting to understand blernsball's rules. 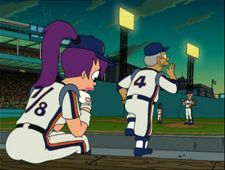 Blernsball is named for Blernsday, an extra day added to the production schedule during season one. Hank Aaron tuned down the role, but changed his mind after Bob Ueker accepted. Both of them were recorded by phone (in another recording studio). At time of recording, Dwight's first episode has yet to air. Abner Doubledeal wasn't named until this episode. The pitching is very realistic. When they were editing the part with the Spanish, Mexican comic book artists were touring the office (which is shared with Bongo Comics). Swinton's spanish speaking housekeeper helpd him write that scene. NNY Mets hats were going to be made for the table read of the episode, but the reading was cancelled, so the hats were too. Hank Aaron XXIV's uniform for the Atlanta Braves is updated from the 20th century design, which used a tomahawk, to feature a trident. This is because Atlanta is now under water. Hank's recording was fairly hurried as he needed to go to a meeting. There was originally a tour sequence for Leela at the field with the manager. The fields are accurate recreations of real-world baseball fields. This page was last edited on 5 May 2010, at 01:08.